Rubber stamping is a popular hobby that has a wide number of applications. Whether you are new to rubber stamping or you are looking for new ways to indulge yourself in this hobby, it is worth looking around at different projects. Stamping projects fall into a broad number of categories. Some crafters work only within one type of rubber stamping, while others diversify their work. Create a floral card by combining a number of different floral stamps into a single theme. Decorate a card with retro designs that ape the fabrics of the 1950s and 1960s. Nearly any design will make a lovely looking "Thank You" card, provided that you stamp the words on it. This works for a number of other types of cards, such as "Get Well" cards or cards expressing condolences. Make a birthday card in much the same fashion as any other, though tying it closed with a piece of ribbon gives it a bit of an extra "birthday" flavor. String together a number of your stamped cards on a decorative garland that you hang in your home. Externally decorate the scrapbook. Get a book with a cover in a material you like. This can be blank or have a design that you feel would be enhanced with your rubber stamps. Decorate the cover with any design that seems appropriate, from flowers, birds and other scenes from nature, Atomic age patterns or things that evoke the memories that you are scrapbooking. Be sure to spray the cover with a varnish or other topcoat to keep it looking beautiful for years to come. Decorate the pages inside the scrapbook. Generally you will want to fill in the pages before you begin rubber stamping or arrange the stamps in such a way that placing things over them will not detract from their appearance. When you think of rubber stamping, you probably don't often think of decorating your home. However, this is a popular way for stamp hobbyists to spend their time. The results will be some truly unique decorations for your home. Make a design with rubber stamps and frame it. You can then embellish the frame with rubber stamps or embossing. Several cards can be places in a single frame for a mosaic effect. You can easily give curtains and other fabrics unique and interesting patterns with rubber stamps and the proper type of ink. Stamp some boxes for storage with decorative flair. This can be done either with wood or cardboard boxes. Upholstery, much like curtains, can be stamped before you reupholster furniture in your home. Rubber stamping isn't just something that you can look at -- it's something that you can wear. You can rubber stamp any blank or patterned fabric if you have the right ink. You can do this either with clothes that have already been made or fabrics that you then make into clothing. Introduce your children to rubber stamping, and you will have something that the two of you can do together for years to come. Many of the crafts above are appropriate for children. You can introduce your children to the art of stamping when they have to make "Thank You" cards or invitations for a party. This can bring a bit of fun into something that is otherwise a chore. Children enjoy a number of benefits from stamping, such as learning how to follow instructions, problem solving, color theory and fine motor skills. You can also teach children how to make stamps out of potatoes. By now you probably have many specific ideas based on the ones above. Your collection of rubber stamps aren't just for putting a single image onto a card. 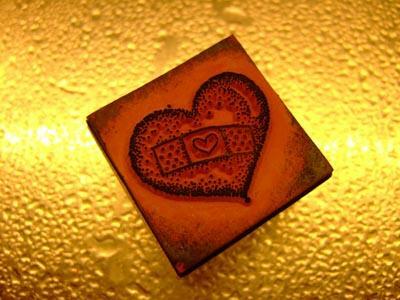 There are a wide array of things that you can make with rubber stamps that will bring joy into your life both through the act of making them and the beauty enjoyed by looking at them.